Using iPhone, you may ask the question: Is it possible to delete photos from iPhone but at the same time keep them on iCloud? Before answering the question, let’s discuss what iCloud is to know why this question exists. 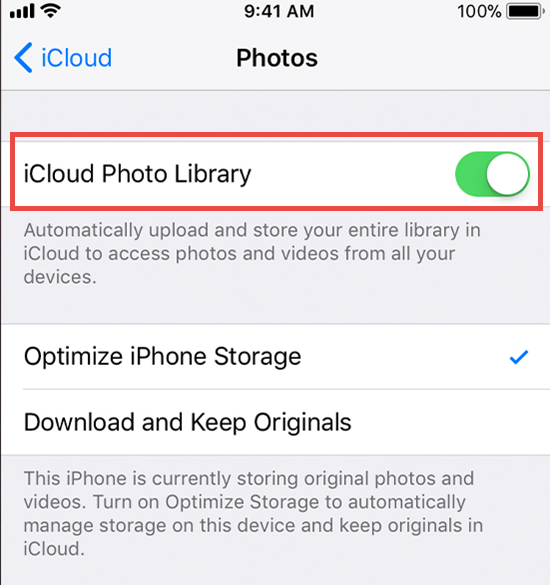 Technically, iCloud has a photo library for sharing, preserving, and storing your photos across IOS devices, therefore if you change any setting in your photo library on your device, it will automatically affect your iCloud data as well. In fact, Apple does not offer the way to delete some photos from your iPhone yet preserving them on iCloud. But there’s always a way for a will: the solutions described here will help you to do the task in an amicable way without disobeying any rules and protocol. The article will display four handy ways that you can use to deleted photos from iOS device but not iCloud. 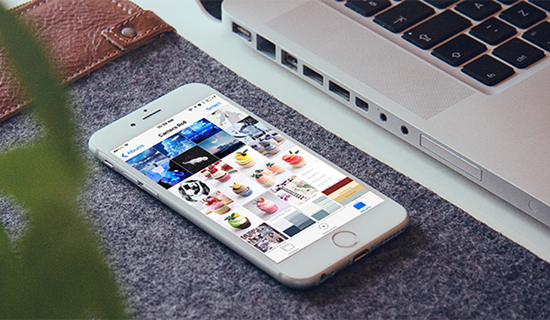 iCloud Photo Library is designed to replicate all your image and videos among your iOS devices. Once this feature is activated, the whole lot you work on your photo on your iPhone is synced to iCloud and other iOS devices or Mac registered under the same iCloud account. This is why, when you add or delete a photo or multiple photos from your iPhone, you will find that same snaps are deleted from your iCloud as well. Make sure you’ve signed in with your Apple ID. Click into this path: Apple ID > ICloud > Photos, then turn off iCloud Photo Library. Now, delete target photos from your iPhone…and you are done. When you turn off iCloud Photo Library on an iPhone, it just means stop syncing the media files on the iPhone, but still keeps synchronization among your other Apple devices. And all your photos and videos that already uploaded to iCloud will remains in iCloud server without damage or losing until you excess your cloud storage limit or re-anble this feature again. If your iPhone storage is an issue, and you actually don’t wish to permanently delete the photos on your iPhone, then there is an option to apply for a third-party cloud service to support your iPhone photographs. There are numerous iCloud substitutes like Google Photos, DropBox, OneDrive, etc. Your iPhone photos can be safely stored in the cloud after uploading, and then you may delete them from your iPhone without changing iCloud Settings. Download and install a cloud app on iPhone that can fit your need. Choose “sync all your photos” when it ask for permission and upload all your photos. Then you can delete on your iPhone not having to worry about the cloud server. Another practical method is to sign into your iPhone with a new iCloud account. After uploading your iPhone photos to iCloud that is integrated to the old Apple ID, you may sign out of this account and sign in with another new Apple ID. Then you may delete all photos from your iPhone without getting them erased from your former iCloud account. And you will be able to access the deleted photos from your other iOS devices by signing in with your old Apple ID. Make sure you have enough space for photos on iCloud. Export all iPhone photos to your personal computer. Delete them from the iPhone to free up iCloud storage. Go to iCloud.com and upload photos to iCloud Drive from computer. These 4 steps seem simple, but sometimes it could be exhausted especially at the transferring part. If you’ve enabled “Optimise iPhone Storage”, you cannot directly export all iPhone photos just by connecting the device to PC, and you need to download all photos on iPhone first by “Download and Keep All Originals”. But if your iPhone doesn’t have enough space, you may need to free up iPhone storage first, or you can use Gihosoft iPhone Data Recovery as a transfer tool to export photos from iPhone to computer. Step 1: Install and run Gihosoft iPhone Data Recovery on computer, select “Photos and Videos”. Step 2: Connect iPhone to PC and click Next to scan. Step 3: After scanning, you can view all photos scanned in the preview interface. Step 4: Click “Recover” to export all photos from iPhone to computer. After the process done, you can check on the exported photos on computer, and delete them on iPhone. Then you can freely upload them to iCloud Drive for preserving. 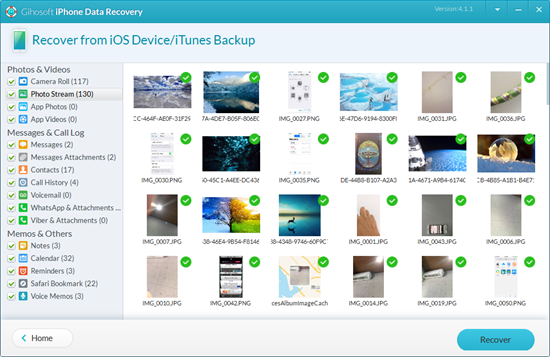 Also, you can use this powerful software to easily recover any deleted photo or video from your iPhone or iPad, and it is also capable of retrieving other import data like text messages, iMessages, contacts, voicemails, safari history, notes and so on. These are easy and simple ways you can delete photos from your iPhone but preserve them in your iCloud account. These methods don’t need too much technical knowledge, so everyone can easily finish the steps even if he is new to iPhone. If you have any question or suggestion, feel free to leave a message in the comments below.